Last Thursday, the official prospect rankings published by the CFL scouting bureau were released. 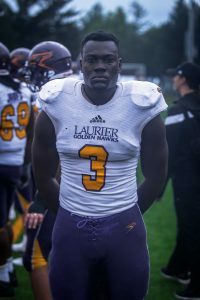 To no one’s surprise, Laurier’s star defensive lineman, Kwaku Boateng was ranked No. 2 overall and the No. 1 ranked CIS prospect available in the upcoming 2017 CFL draft. Boateng and the Golden Hawks have kicked off the 2016-17 season 3-0, defeating Queens, York and most recently, the No. 4 ranked Carleton Ravens 17-16 on the road. “We battled and we knew it was going to be a war in the trenches. I’m just really excited that we came out on top,” Boateng said. The strong performance from the Golden Hawks this year may come as a surprise, since the last time they were 3-0 was in 2007. The Hawks have been confident in themselves and have known their ability and potential along the way and are now just showing the OUA and CIS that they mean business. “It’s a big deal but at the same time it’s not. We already knew our potential and how good we can be, we’re just excited to show the country our ability and proving it,” he continued. The Golden Hawks are also excited and proud to hold an undefeated record heading into homecoming weekend. “To meet the alumni and get to meet some of the football alumni again and be able to present them with 3-0 is pretty special for us,” Boateng said. Boateng described one of the reasons for his personal success so far and the team’s overall success has to do with the chemistry on this season’s squad. Boateng’s personal success this season was most recently measured when the CFL’s scouting bureau was released last week. He is humbled and extremely grateful for the recognition. “It was a shock [how high my ranking was] and a lot of excitement when I heard the news. It sets the bar a lot higher for me. I’m far from perfect as an athlete or as a person. I still know there’s a lot more work to do and I have to keep working harder,” he said. When asked if he thinks about the upcoming CFL draft often and what it would mean for him to be picked up by a CFL club, Boateng acknowledged how grateful he would be. Boateng and the Golden Hawks’ goal for the the rest of the season is simple and straight forward.